Tridentis AMV provided support to the US Marine Corps (USMC) BIC Maritime Pre-Positioning Force (MPF), where we provided advanced engineering services for multiple feasibility studies to determine the ability to stow, deploy and retrieve Improved Navy Lighterage System (INLS) modules, the Amphibious Bulk Liquid Transfer System (ABLTS), MPF Utility Boat, and USMC MPF vehicles on a T-AKE class vessel. 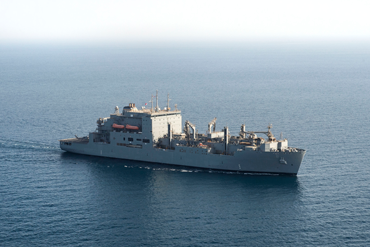 We provided Marine Engineering and Naval Architect services to determine the required ship modifications, weight estimate and cost estimates for each of these tasks. Additional work included performing a Ship Condition and Deficiency Surveys, Marine, Mechanical, and Naval Architecture Conceptual design, Structural Analysis, Time and Cost estimation, and Economic Analysis of Engineering and Operational Options.